Info: This feature requires Content Station 10.9 or higher. Sticky Notes can be added to an InDesign layout as a way of leaving short messages to other users — including InDesign and InCopy users — for instance to indicate any changes or corrections that need to be made to the content of a page. 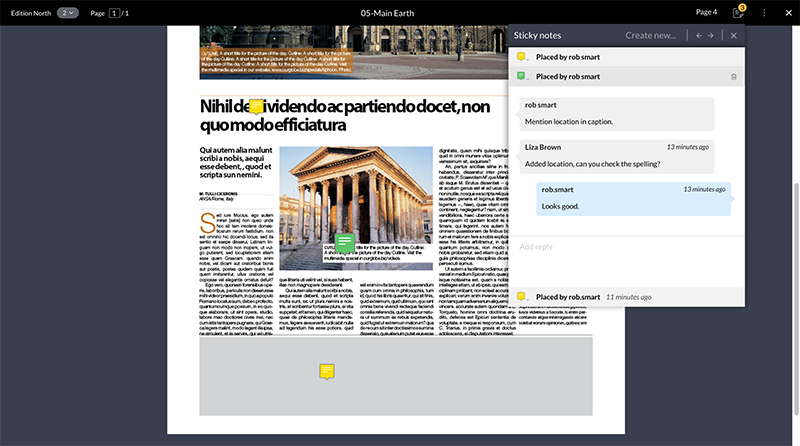 Working with Sticky Notes in Content Station 10 is done when viewing a layout in Preview mode. A Sticky Note icon in the menu bar. It is used for accessing the Sticky Notes panel. It also shows the total number of Sticky Notes placed (if any). A Sticky Note panel. This panel contains the messages of each Sticky Note and various tools for working with Sticky Notes. A Sticky Note icon on the page. This icon is used for showing to which part of the layout the messages relate to. 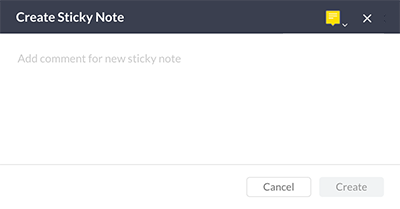 Sticky Notes can be added, replied to, edited, removed, assigned a status, and navigated. Figure: A layout with three Sticky Notes added. The conversation of each Sticky Note can be followed through the Sticky Note panel. Click the Sticky Note icon in the menu bar to open the Sticky Note panel and click Create new... .
Right-click an existing Sticky Note icon on the layout and from the menu that appears click Create new Sticky Note. Step 2. Click anywhere on the preview to place the Sticky Note icon. Note: The icon can be moved anytime after it has been added. A window appears in which you can add a message. Step 3. Add a message and click Create. Click the icon on the layout. The Sticky Note panel will open (if it isn't already) and the conversation of the Sticky Note is expanded. 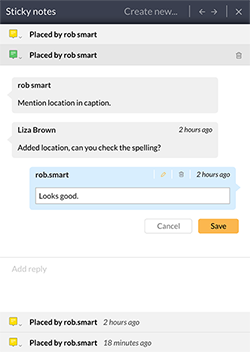 In the Sticky Note panel, click on the collapsed conversation. Step 2. At the bottom of the panel, add your reply and press Enter. You can only edit the text of messages that you have added yourself. The text that was added when the Sticky Note was created cannot be edited. Step 1. 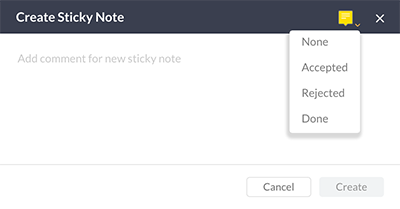 In the Sticky Note panel, locate the message that you want to edit. Step 2. Hover your mouse pointer over the message and click the Edit icon that appears. Step 3. Edit the text and click Save. Step 1. In the Sticky Note panel, locate the reply that you want to remove. Step 2. Hover your mouse pointer over the message and click the Delete icon that appears. A message appears asking to confirm the action. Step 1. In the Sticky Note panel, locate the Sticky Note that you want to delete. To set the status of a Sticky Note, click the Status icon and choose the status. The Status icon is available in the window when creating a new Sticky Note and for each Sticky Note in the Sticky Note panel. Figure: Choosing a status when creating a Sticky Note. Figure: Choosing a status for a Sticky Note in the Sticky Note panel. Click an icon on the layout. The Sticky Note panel will open (if not already open) and the conversation is expanded. Click on a conversation in the Sticky Note panel. The conversation will expand while all other conversations will collapse. When the icon is placed on a different page, that page is shown. Use the Previous/Next buttons at the top of the Sticky Note panel. The icon on the layout for the currently viewed Sticky Note will show in a larger size than all other icons. When using the Previous/Next buttons, the icon that you are navigating to briefly animates to show you where it is located.